This pretty, easy-growing, flowering vine is a good butterfly-attractor. So it's kid-pleasing in every way. If you have a structure that your morning glory can climb on, to get to its full length of about 8 feet, it'll be happy and productive all summer long. a garden arch in a beautiful way. 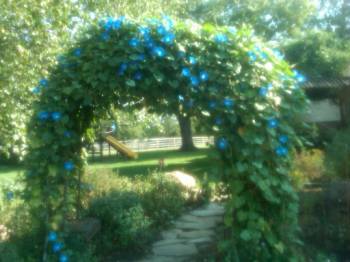 Look how many blossoms are on this arch, with only four morning glory seeds planted at the base. The secret is to find a fence, post, wall or other structure that can support the vines and get them up off the ground. It's great if you can plant morning glories somewhere near where you might often sit or see out a window, because butterflies will visit these prolific bloomers and put on a real show. Ideally, the spot you choose will have morning sun, and afternoon shade. In places where it gets too hot and sunny in the afternoon, morning glory leaves tend to droop and look kind of unsightly. The coolness of evening revives them. For that burst of "morning glory," literally, it may be worth it to put up with the afternoon blahs! This plant likes moist "feet" - meaning, water lightly every day if you can. It's OK to fertilize from time to time, but avoid using fertilizer that has nitrogen, because you'll get all leaves and no flowers if you feed morning glories too well. They really are kind of a weed, and sprawl around in wildflower meadows or cause problems around agricultural crops. One of the best things about morning glories is that they are cheap. They are an annual flower that grows from seed. So you can put on a beautiful show for only about a dollar or so, with just a seed packet purchased at a local nursery or hardware store. Besides blue, you can find seeds for purple, white and reddish blossoms. You'll always have more seeds than you can possibly use in one place, so offer to share or swap with other gardeners for other kinds of seeds. To plant morning glories, it's a good idea to "nick" the seeds, or slice into them just a little with a sharp knife (with adult supervision), the night before planting, and soak the nicked seeds in water overnight. You might place a little compost on the planting spot, and dig it in to the soil before you plant the seeds. Then simply sprinkle each day with a little water 'til you see a sprout. Coax each sprout to the fence, arch, post or wherever you want it to climb. And keep watering. These might be a good project to start from seed in milk cartons or cups at school, as a group, to watch them sprout, and then send one seedling home with each student with instructions on how to grow. At the end of the growing season, after a hard frost kills the vines, it's best to compost or throw away all the vines and blossoms, and start fresh next year. Sometimes, a morning glory blossom containing seeds will fall to the ground and a "volunteer," or unexpected, vine will sprout the next year. It's probably best to uproot and discard volunteers, as their colors are often not as good as the original.